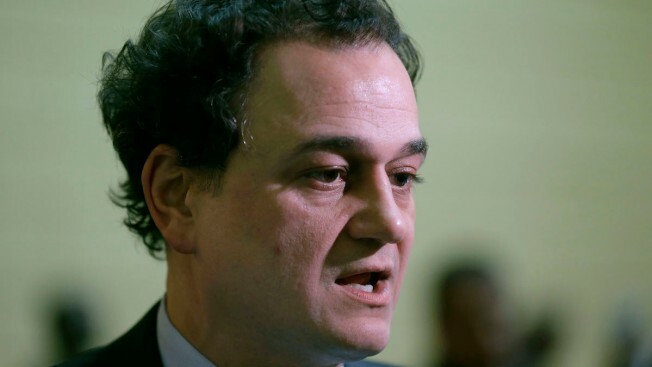 In this April 30, 2014 photo, former Rhode Island House Speaker Gordon Fox speaks to reporters on the floor of the House Chamber at the Statehouse in Providence, R.I.
Former Rhode Island House Speaker Gordon Fox has pleaded guilty to charges of bribery, wire fraud and filing a false tax return following an investigation that included a dramatic federal raid on the Statehouse. Fox appeared in federal court Tuesday. The government has recommended a three-year prison sentence. Fox maintained his composure, but his voice broke when admitting to the conduct and acknowledging he'd likely lose his law license. Fox acknowledges in court documents he received $52,500 in 2008 to help grant a liquor license to a Providence bar when he served on the city's board of licenses. He acknowledges making about 28 interbank transfers totaling $108,000, taking money from his campaign account and using it for personal expenses. Fox was once considered among the most powerful politicians in state politics.